The PUNCH had done an investigation into how many Nigerian students seeking to study in US schools were denied visas despite spending a lot of money on different fees. Our correspondent was further told that the embassy usually issued preprinted blue papers to those it rejected without giving a specific reason for the decision. More than three weeks after enquiries were sent to the embassy, no response had been got by The PUNCH. 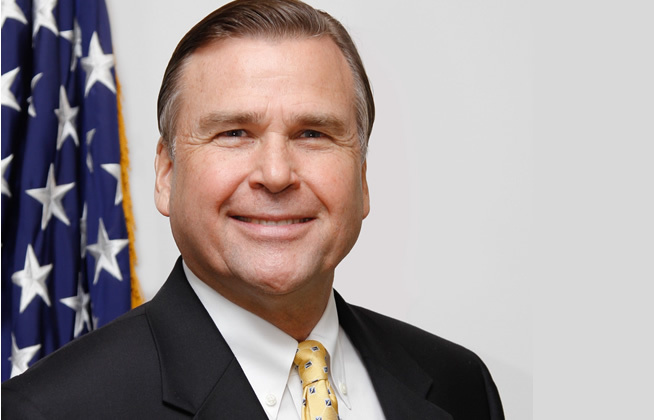 A former ambassador to the US, John Campbell had, however, told our correspondent that visas were given by consular officers on a case by case basis, adding that the refusal of many people to return home after finishing their programmes made the process difficult. The activist, Bello, petitioned the National Assembly through a member representing the Ede and Ejigbo Federal Constituency, Prof. Mojeed Alabi, after suffering a similar fate of denial. 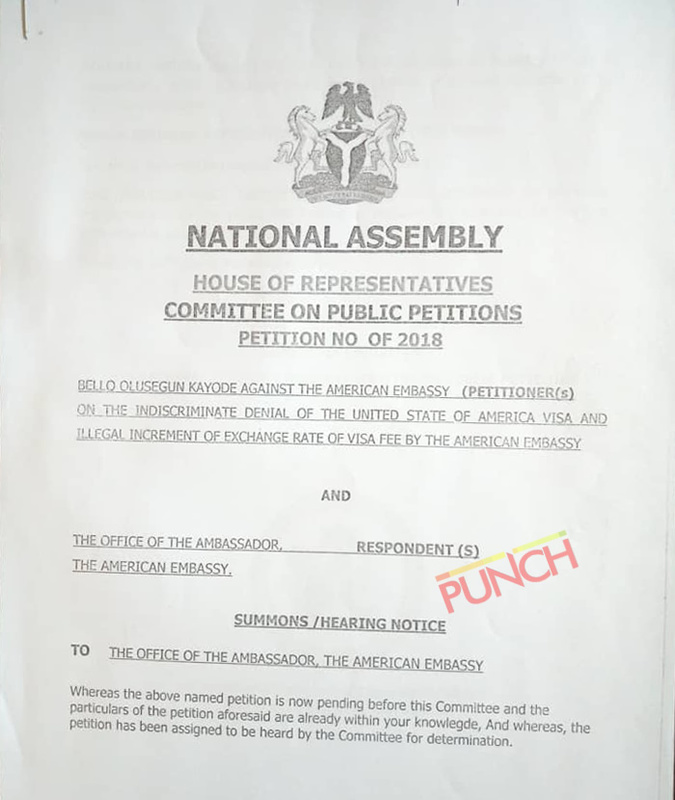 The summon, titled, ‘Indiscriminate denial of United States of America visa and illegal increment of exchange rate of visa fee by the American embassy’ was signed by the House Committee Chairman on Public Petitions, Uzo Azubuike. 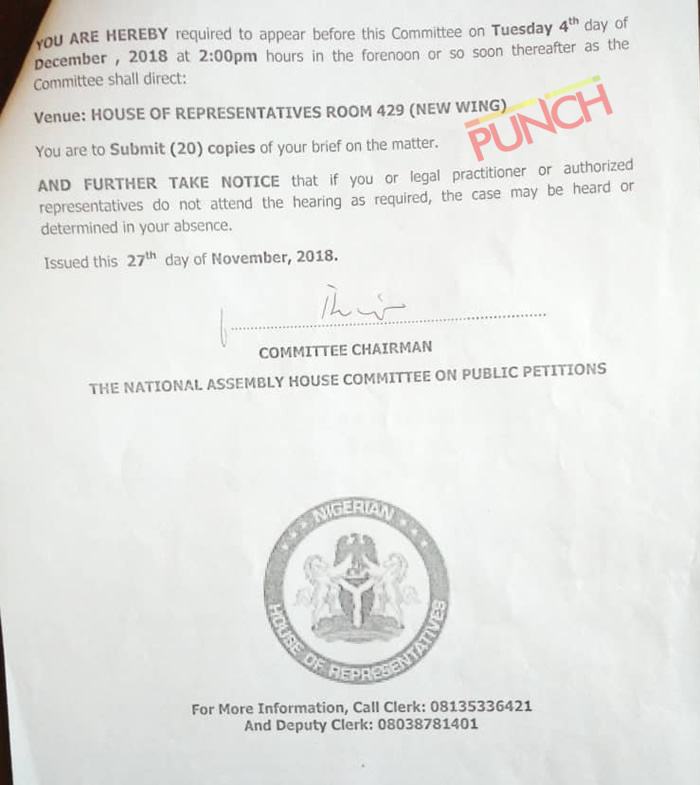 The two-page document, dated November 27, 2018, and a copy of which was received by our correspondent, said the hearing would hold on Tuesday, December 4 at 2pm at the House of Representatives Room 429. The House asked the ambassador to present 20 copies of his defence. The Clerk of the House, Mr Omale Adoyi, confirmed the development to our correspondent on Monday. He, however, said the US embassy rejected the summon. “But we will go on with the hearing and may have to adjourn if they fail to show up,” he added.